The Nuclear Regulatory Commission (NRC) is holding a Small Business Exchange and Matchmaking Event on Wednesday, June 5, 2019 in Atlanta. In addition to the NRC, other government agencies and prime contractors will be in attendance. The event is being held at Georgia State University, 33 Gilmer Street S.E., Atlanta, from 8:00 am to 3:30 pm. The Georgia Department of Economic Development’s Centers of Innovation is hosting an event giving you a chance to grow your business with other aerospace and defense suppliers. The April 19th Networking Reception and the April 20th Conference are being held at the Middle Georgia State University Conference Center, 100 University Parkway, Macon, GA 31206. The cost to attend is $95. Network with others at the evening reception on April 19th. Attendees can request to participate in 1:1 FAST PITCH sessions to promote your company’s capabilities to buyers including: Airbus, Lockheed Martin, and Meggitt Training Systems. Interested companies need to complete their FAST PITCH profile by March 31st at the registration link. All completed FAST PITCH profiles will be made available to the participating buyers, who will then select their matches for FAST PITCH sessions. The Networking Reception (business casual) will be held on April 19th from 5:30 to 7:00 pm to give attendees more informal networking opportunities. Be Prepared: Please come prepared with your “elevator” speech to share your company’s capabilities, what sets you apart from the competition, and be able to share what kind of connections would be most helpful to you. Bring plenty of business cards and brochures to leave with your new connections. 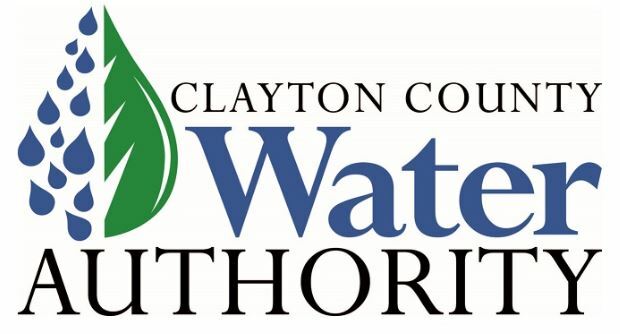 The Clayton County Water Authority and Clayton County government are holding their 2nd annual Small Business Expo on Thursday, Jan. 19, 2017, from 10:00 am to 2:00 pm. The event is designed to provide networking opportunities for prime contractors and local, minority and women owned small businesses. 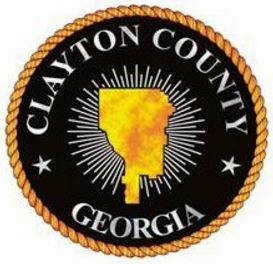 The Expo will be held at Clayton State University, Student Activity Center, 2008 Clayton State Blvd., Morrow, GA 30260. Questions about this event may be directed via email to ccwa_slbe_program@ccwa.us or (770) 960-5880. It’s never to early to plan ahead! A packed auditorium of business people at last year’s event heard briefings by government officials on upcoming contracting opportunities as well as advice offered by successful entrepreneurs on strategies for pursuing government contracts. Last year, the Industry Day drew nearly 300 people — representing both small and large businesses, government agencies, and experts in the field of government contracting. 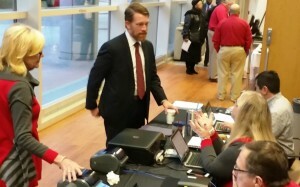 More than 500 individual appointments were conducted between small businesses and buyers. Details of last year’s event can be found by clicking here. Registration for the 2017 event is not yet open. Watch for an announcement about registration details to be published here in late November or early December 2016. And circle the date — Jan. 24, 2017 — on your calendar now! The 2016 Missile Defense Agency (MDA) Small Business Programs Conference will be held in Huntsville, Alabama on June 8-9, 2016. The tentative program includes briefings from the Office of the Secretary of Defense (OSD), Office of Small Business Programs, the Directors of MDA Acquisitions, MDA Contracts and Program Office officials on relative upcoming MDA procurements. Also, the MDA Small Business Advocacy Council (SBAC), along with applicable MDA program office representatives, will be in attendance to discuss small business opportunities, one-on-one, with individual company representatives. Note: Exhibitors will be available throughout the entire Matchmaking period. The National Contract Management Association’s Atlanta Chapter sponsored the Industry Day, including underwriting the cost of the technology used to manage the event. 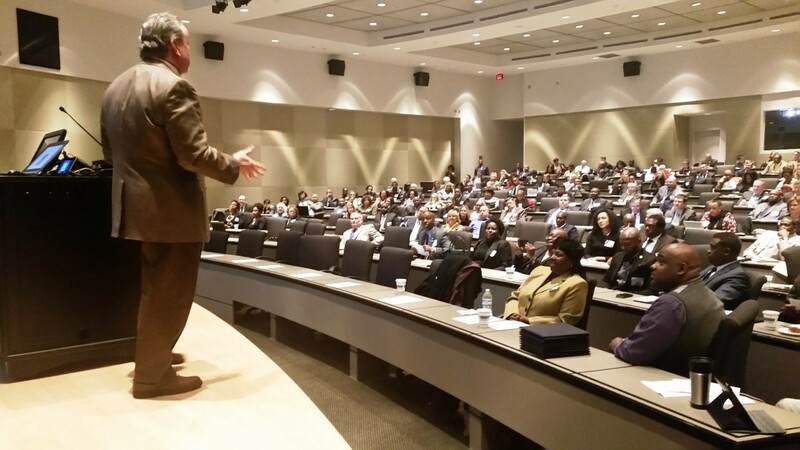 Nearly 300 people – representing 145 small businesses – got face-to-face with the buyers of 59 government agencies and prime contractors at an event hosted by the Georgia Tech Procurement Assistance Center (GTPAC). 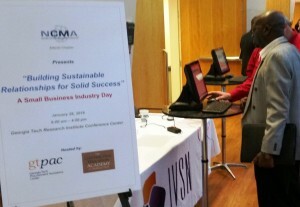 The Small Business Industry Day was sponsored by the Atlanta chapter of the National Contract Management Association (NCMA) on Jan. 28, 2016 at the Georgia Tech Research Institute’s conference center in Atlanta. 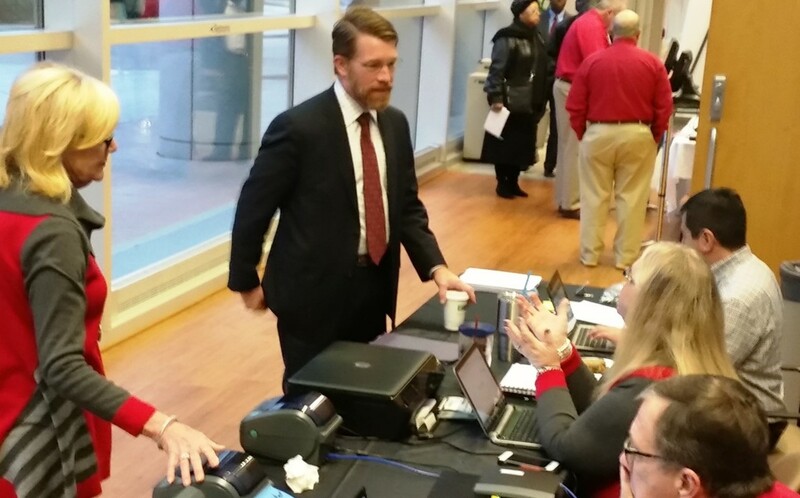 Mark Teskey, small business director for the U.S. Air Force is seen here at the registration desk. The day-long event featured briefings by government officials on upcoming contracting opportunities as well as advice offered by successful entrepreneurs on strategies for pursuing government contracts. The highlight of the day was the matchmaking portion of the program where small business were matched with buyers from local, state and federal agencies, along with large prime contractors. In all, 589 individual appointments were conducted between small businesses and buyers. 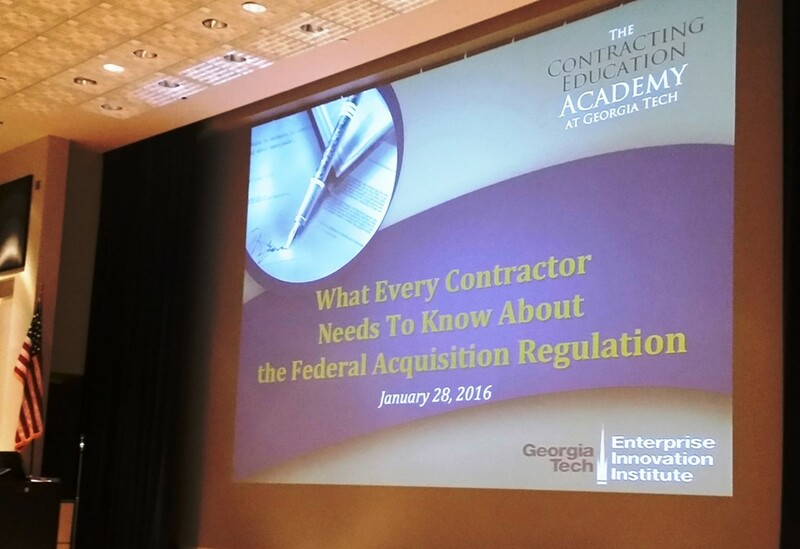 The Contracting Education Academy at Georgia Tech conducted a 3-hour briefing for contractors on the Federal Acquisition Regulation (FAR). Running concurrently with the matchmaking sessions was a presentation on “What Every Contractor Needs to Know about the Federal Acquisition Regulation,” conducted by one of Georgia Tech’s professional education units, The Contracting Education Academy. Scores of people attended this workshop as a productive way to spend their time between appointments. The keynote speaker of the day was Kenyata Wesley, deputy director of the Defense Department’s small business office. 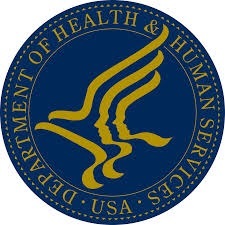 Other featured speakers were Denean Machis, NCMA’s professional development officer; Joe Beaulieu, GTPAC’s program manager; Gwendolyn Miles, small business officer for the Centers for Disease Control and Prevention (CDC); Prudence Howard, regional contracting director for the Dept. of Veterans Affairs (VA); Mark Teskey, small business director for the U.S. Air Force; Jeff Napier, director of acquisition services for the CDC; and Tony Ortiz, small business representative for the Federal Aviation Administration (FAA). Tony Ortiz with the Federal Aviation Administration’s small business office explained how the FAA does business. Offering advice and insights into the government marketplace were small business representatives Gerald Boyd, CEO, DB Consulting and Kevin Grimes, CEO, CFO Leasing, Inc. Wrapping up the morning’s presentations, NCMA chapter president Carlos Smiley recognized several individuals and organizations for their support of Small Business Month activities. Nearly 300 business people heard briefings by government officials on upcoming contracting opportunities as well as advice offered by successful entrepreneurs on strategies for pursuing government contracts. Attendees at the Industry Day used a special web site and a smartphone app to register for and check-in at the event, and make their matchmaking appointments. The website (http://www.ivsnevents.org) and the app were developed by IVSN Group LLC. The leadership of NCMA’s Atlanta Chapter contracted with IVSN to manage registration and appointment-making for the large Jan. 28 event. The app – called PTACGo! – is downloaded free from Google Play (for Android devices) or Apple’s App Store (for iPhones). It allowed users to register in advance for the event and make appointments on smart phones, tablets, laptops and PCs. “Big data” expert and GTPAC client Riverstone Solutions, Inc. worked with IVSN on data storage and analytics. Rocky Top Event Management Services provided on-site management for the day. On-site check-in was quick and easy. At kiosks that were set-up at the entrance (photo at left), registrants simply typed the first few letters of their last name. This caused their name tag to be printed (center photo). Event organizers then pulled the self-adhesive tags from printers and helped attendees put them on (photo at right). In addition, helpful messages were “pushed” through the app to attendees throughout the day (e.g., matchmaking is about to begin, workshop scheduling, handout availability, and reminders to complete the post-event survey). 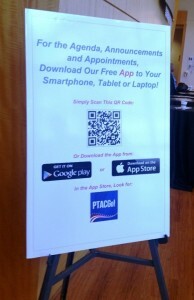 Any attendees who did not download the app in advance used a QR code on display in multiple locations at the event to allow them to download the app on-site. On the day of the event, attendees simply typed-in the first few letters of their last name at kiosks set up at the entrance. Once matching their registrations, bar-coded name tags automatically were printed. The bar-coding allowed for tracking of appointments fulfilled and workshop sessions attended. All attendees benefited from individual matchmaking appointments with buyers from six federal agencies: CDC, VA, Army Corps of Engineers, Environmental Protection Agency (EPA), General Services Administration (GSA), and the Small Business Administration (SBA). 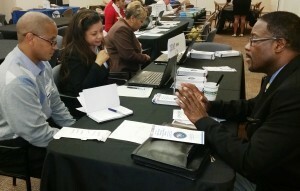 State and local government agencies also participating in small business matchmaking were: Georgia Dept. of Administrative Services (DOAS), City of Atlanta, Atlanta Housing Authority, Clayton County, Clayton County Water Authority, and DeKalb County. Federal prime contractors participating in matchmaking sessions were: Amec Foster Wheeler, Booz Allen Hamilton, Georgia Industries for the Blind, Georgia Power, ICF International, IBM, JBS International, LMI, Lockheed Martin, Northrup Grumman, RTI International, and Source America. In all, there were 20 federal prime contractors in attendance who used the networking time between sessions to identify small businesses who might be used to fulfill their contractual small business subcontracting goals. Scores of the small businesses in attendance also took advantage of this occasion to receive contract-related counseling from the team of six GTPAC counselors who were on hand. GTPAC representatives provided help to businesses on such topics as registration in the System for Award Management and creating capabilities statements. 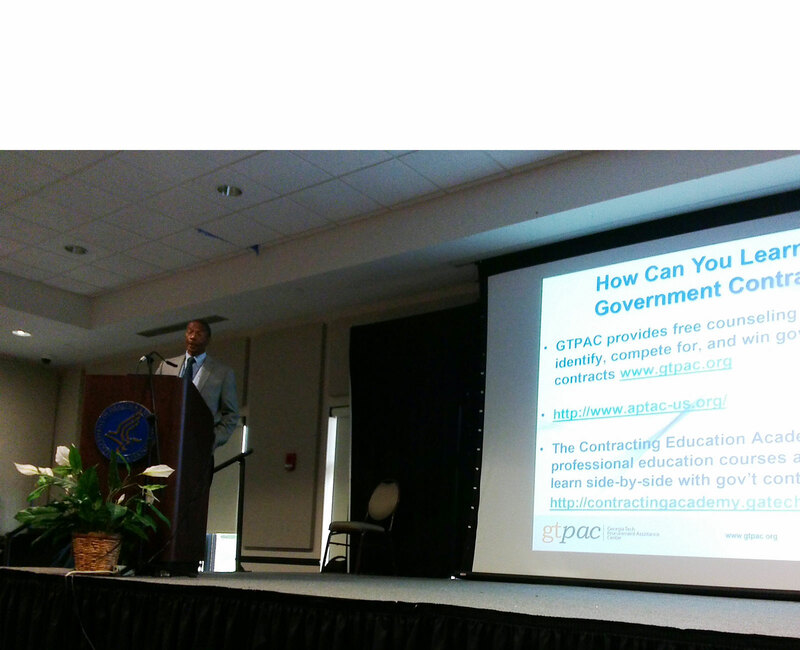 GTPAC also helped out-of-state attendees connect with the Procurement Technical Assistance Center (PTAC) in their locale. 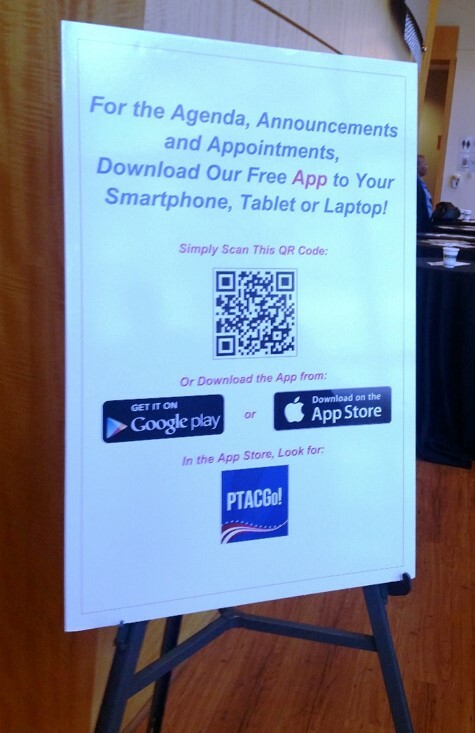 Attendees learned that the app – PTACGo! – that they installed on their phones, tablets and laptops can be used in the future to alert them to similar events coming up across the country. Examples include next month’s Alliance Northwest small business event hosted by the PTAC in Washington State and the National MBE Manufacturers Summit hosted by Georgia Tech’s MBDA Center. 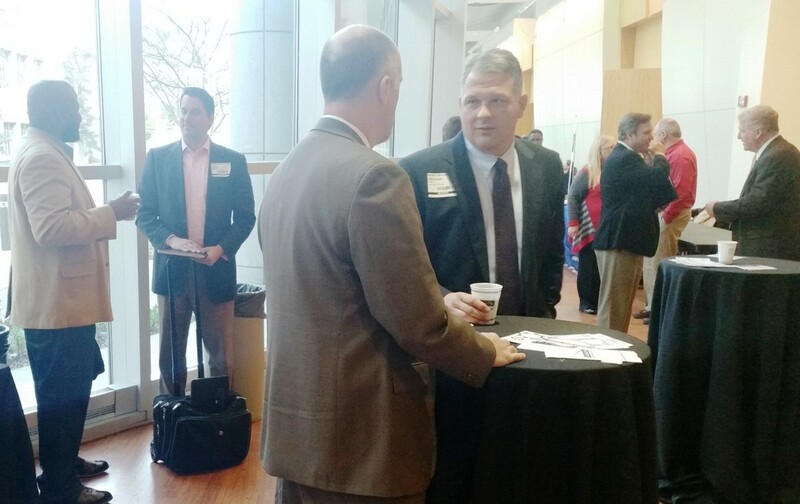 Industry and government representatives were able to exchange credentials and opportunities with one another during networking breaks and over lunch. The vast majority of attendees (88%) at the Jan. 28 event represented Georgia businesses, and business persons from Florida, Alabama, Tennessee, North and South Carolina, Maryland, Virginia and New York made up the balance of the attendance. According to survey results, 62% said it was the first time they had ever attended an event like this, and 93% of attendees asked to be advised of upcoming events. Satisfaction with the Industry Day was very high: 97.5% of attendees said the overall event met or exceeded their expectations; 100% said the registration process worked well; 97% found the check-in process easy; 82% liked the app; and 95% found the workshops and the matchmaking sessions meaningful. 589 individual appointments were arranged between small businesses and buyers from government agencies and their prime contractors. The Georgia Tech Procurement Assistance Center (GTPAC) is hosting a multi-agency, small business Industry Day on Thursday, Jan. 28, 2016. The event is sponsored by the Atlanta Chapter of the National Contract Management Association (NCMA) and will be held at the Georgia Tech Research Institute’s conference center from 8:00 am to 4:00 pm. Advance registration is required. The day will feature information on upcoming government contracting opportunities, workshops, and matchmaking appointments between small businesses, agencies and prime contractors. For complete details, including the detailed agenda, and to register, please visit: http://www.ivsnevents.org.